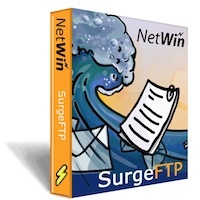 SurgeFTP ftp server - is a secure FTP server that provides industrial strength secure SSL/TLS encryption, powerful FTP server performance, full and complete reporting tools and most importantly, ease of management. This advanced FTP server software features full SSL/TLS security for Windows, Linux, FreeBSD and Solaris, making it a great option for those why need FTP Server Windows (including FTP Server Windows 7), FTP Server Linux and more. With a few clicks you can generate a report to show who's using your server, and more importantly who is misusing it, wasting your bandwidth and resources. Existing Authentication Modules for LDAP, SQL, ODBC, Radius, nwauth. Works with multiple platforms, including FTP Server Windows XP, FTP Server for Windows 7 and more. SurgeFTP - Considered the best FTP server software by many. We pride ourselves on giving our customers unparalleled service, if you have questions, problems, or even need a feature added in a hurry we will bend over backwards to satisfy your needs, have you had a better offer recently? Satisfaction Guaranteed! Are you sick of buying software and then finding it doesn't do what you want, or doesn't even work! We stand behind our software, if you are not satisfied with the product, performance or customer support we will refund 100% of your purchase price. "ALL the programmers, support people, accounting people, well the entire company is OUTSTANDING - If you are or were a US Marine you will know what that means ! I have NEVER had the responsiveness that Net Win provides ! The technical support is the best I have ever worked with. They do NOT give up, they help you all the way ! Even before the purchase ! From this stand point alone, everyone who operates an ISP and provides custom FTP, EMAIL, and CHAT services NEEDS these products ! Jon Unglert - CEO - Ix Technologies, Inc & ISM Group, Inc."
Pre Sales Support surgeftp-support@netwinsite.com Ask your questions now!